Glass bakeware for the freezer can seem expensive at first, but they add up and will last you a lifetime. These freezer containers are environmentally friendly but not always ideal for freezer cooks in a hurry because hey can crack if you quickly move them between extreme temperatures like the oven and freezer. Don't put your glass bakeware directly from the freezer to the oven or vice versa. The glass could crack. 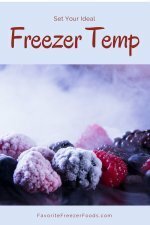 Plus, hot food shouldn't go directly in the freezer because it raises the freezer temperature. Also avoid putting hot glass containers on metal surfaces like your stove burners or getting it wet with a damp hand towel, pot holder etc until it cools down. And glass takes a lot of your coveted freezer space that could be better used for food. 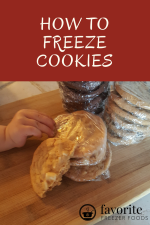 Have Your Pat and Freeze In It Too There is an easy way to take advantage of your glassware like pie plates, casserole dishes, square or rectangular pans and the like without worrying about them cracking or leaving them locked up in the freezer. You can line your pan while preparing and freezing your meal and then, after the food is solid, take it out of the pan. This means you have a freezer meal prepared in the shape of your pan and that you can use the pan for other things until you're ready to eat that meal. The simplest way to do this is to turn your empty pan over so the bottom is up and the top is face down on the counter. Take a piece of aluminum foil and cut it so that it's long enough to cover the whole container. I measure the bottom and sides and double that. If it's not big enough to cover the top and bottom sides with enough left over to fold into the top then cut two pieces. Fold the seem of the two pieces together. Move to the center of the aluminum foil and press it against the empty upside down pan so the foil holds the shape of your container. Keep the foil as flat and smooth as possible on the bottom and sides so it's less likely to tear or get served with your food. You can also line the foil with something else, like parchment paper or freezer paper that doesn't tear as easily prevent the foil from ripping and being served with your food as you scrape the bottom of the pan. Take off the foil and turn over the pan. Put the foil inside and fill it with your meal as usual. Fold in the top and bottom sides then fold in and seal the left and right sides. If your using hot ingredients make sure they cool before you put them in the freezer. Once the meal has frozen solid you can take it out of the pan and use the pan for other things. Be sure to label your meal, a Sharpie works great on foil. Include the name of the dish, any thawing and reheating instructions and add it to your freezer inventory sheet. Is a glass container right for you? Must say freezer safe - some might crack. Can crack going from freezer to a hot oven. Take lots of space in the freezer. Learn more about pyrex bakeware - the most popular glass containers available. Return from Glass Bakeware to the homepage of your freezing food guide.